The Spirit Store will be open until Saturday, Sept 8! information will becoming out the week of Sepemer 17th. Look for it in the newsletter that week. 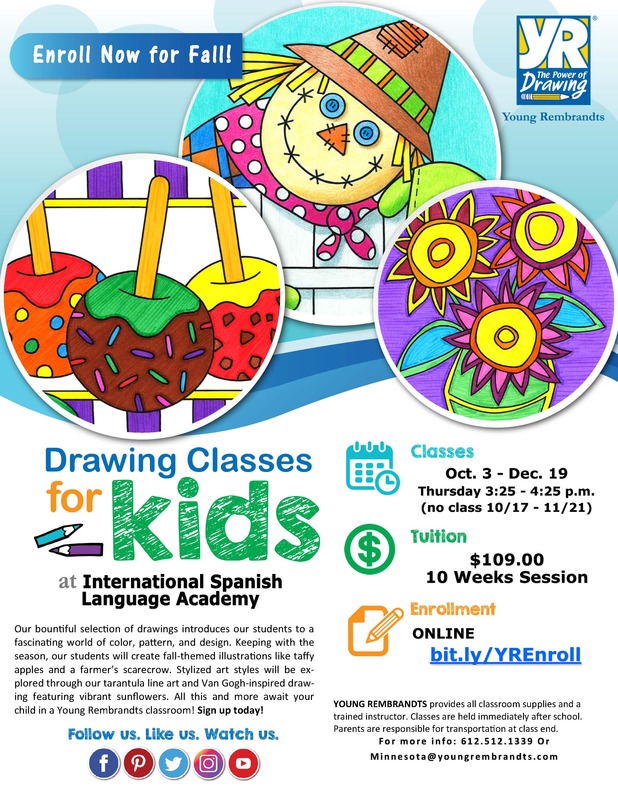 To contact Aventuras regarding changes to your child’s schedule, you can e-mail them at Aventuras@isla-academy.org. As you enter the parking lot,the bus area will be blocked off in part by cones, with areas for the buses to pass through. Cars do not drive beyond the cones. Parents bringing their children to school in the morning will drop –off on the east side, parallel to the building, where the striping and signs indicate so. Please pull ahead as far as you are able, to the southern-most sign on the east side of the building. A number of cars can all drop off at the same time, and adult supervisors will help students get out of their car and walk in the building. Consider the striped area as a sidewalk; you are not to drive on the area, as it is meant to be a walking area for students. You may begin drop off when staff are out to supervise at 8:45 am. Children must stay in the striped area, and may not enter from the parking lot, as the buses will be leaving the lot once the bus has been emptied and we don’t want children crossing the path of a bus. Please do not get out of your car when dropping off your child in the drop off line. Your student should exit your car on the passenger side. If you cannot drop off your child in 30 seconds to allow for good traffic flow,you are invited to park and walk your child into school. When walking from the parked car area to school, please use the marked crosswalk at the North end of the parking lot. Do not run in between cars in the drop off line. Please be vigilant and follow the directions of the staff outside. A number of people will be supervising to ensure drop-off is safe. Sept 27 – Picture Day – Kinder, Gr. 3 & 6. Sept 28 – Picture Day – Gr. 1-2 & 3-4. Interested in helping your child's class? Becoming a room parent is a great way to volunteer at ISLA. Room Parents support and work together with our amazing ISLA teachers to plan a handful of classroom activities, including celebrations and a classroom auction item for the Fiesta de la Primavera. Ideally, two parents will work together in each classroom to support each of your children's teacher and classroom throughout the year. If you have any questions and/or would like more information, please contact Alexia Pettersen at alexiapettersen@gmail.com. Thank you for considering and your help! 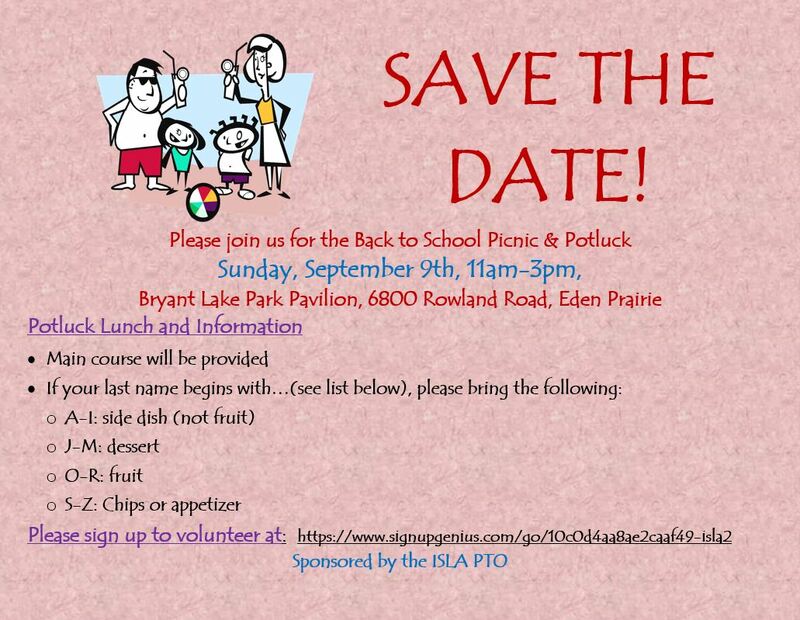 Are you looking for a fun opportunity to help out and see the kids during the school day? Sign up for helping out during the lunch hour! Prep for Lunch, Greet the Kids, Serve Food, and Clean Up while working alongside another ISLA volunteer and Scott (ISLA's lunch manager). Opportunities include regular weekly/bi-weekly/monthly assignments as well as substitute assignments as needed throughout the year. Signing up for the lunch substitute list is a great way to help out on an ad hoc or last minute basis. (There is no commitment to signing up for the sub list.) Signup on Sub list on 9/1 time slot to be added to the sub email list. ISLA is looking for 8 volunteers to come in next Wednesday, September 12th from 9:15 am – 12:15 pm to unpack and set up our new Chromebooks.